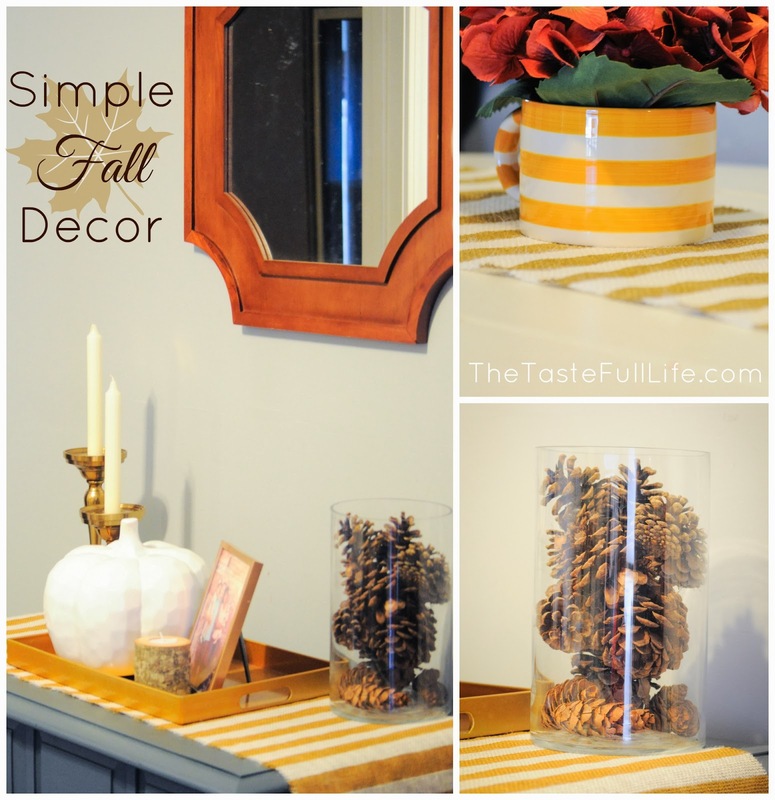 Today I'm sharing a simple and quick fall vignette! Although I am very festive I sometimes get overwhelmed by choices and then end up doing nothing. That describes me in general, but is definitely true when it comes to my seasonal decor. So take my tiny budget and my proclivity to buy something because it's inexpensive vs. because I really like it, and well you get a general lack of progress. I end up not using items I bought a season or two ago because I no longer like them. I'm getting better by buying one item a season to build up a collection, but it's slow going! Just keepin it real folks. I'm sure someone out there can relate. Anyone? Don't judge me. I told you it was simple. 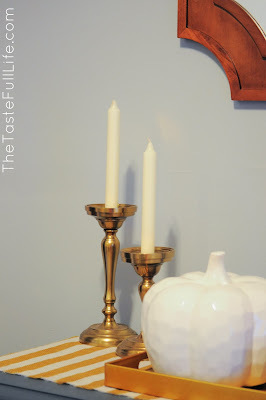 The runner looks really yellow in these photos but it's actually "antique" gold and was a DIY from Live the Fancy Life. I LOVE it and made two. The one under the small floral arrangement is a little different. I accidentally bought classic gold. I prefer the antique. If you're looking for a simple DIY try this one! So easy and dare I say, fun? 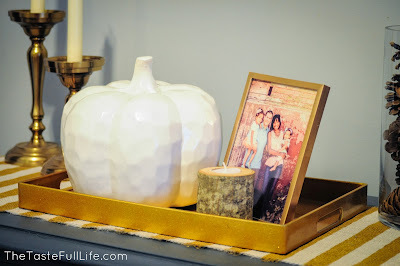 As I mentioned I already owned everything except the pumpkin. I got it from Marshall's for $12.99 and I love it! 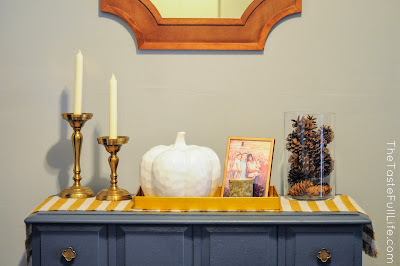 Plus one of my fave bloggers had it on her mantel for fall which made me feel super cool. (Apparently I'm still in high school). The runner was an inexpensive DIY and even "new," most everything on the table was thrifted, from yard sales, discount stores, etc. Oh wait, I lied. 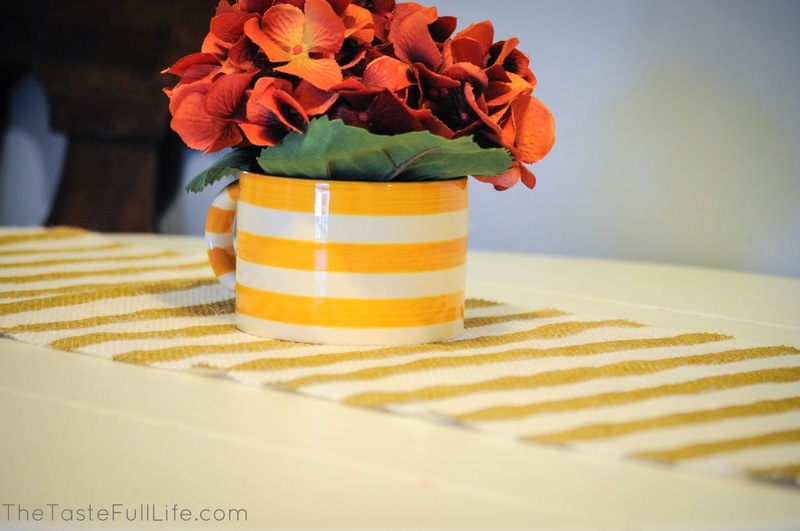 The little floral arrangement I recently made from an over-sized Target mug on clearance ($1.50) and a stem on clearance ($4.88). So that's it. It's amazing how our surroundings affect our mood--for better or for worse. 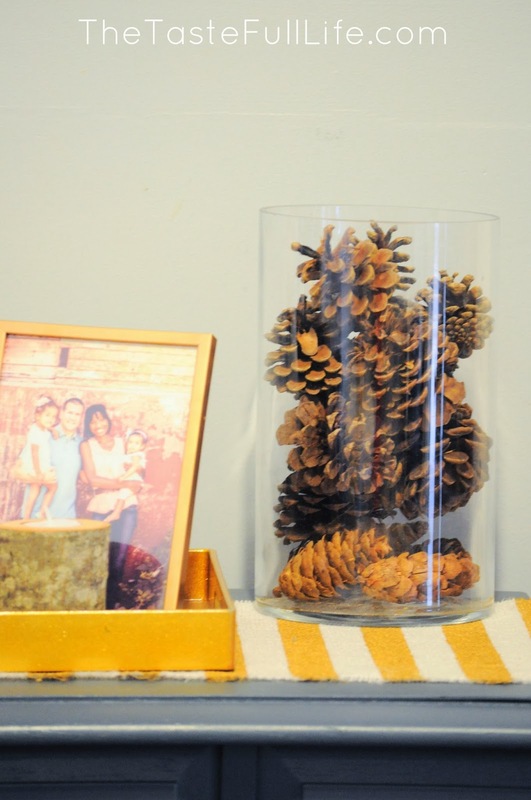 Hope you're inspired to take even a tiny section of your home and make it pretty! I love this! I'm pretty bad at vignettes and have been working on focusing on a few small areas using things I already have. Once set up, I'll maybe buy something to finish it off. I love the pumpkin so much! This really looks great! I'm having a hard time believing that YOU are bad at vignettes!! ;) Thanks for your comment and the pumpkin totally looks like "you!"